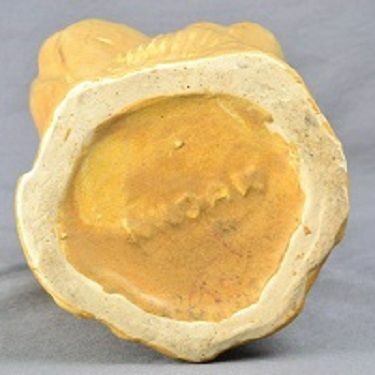 The Eagle Pottery Company was well aware of the importance of marking their products, either through impressed marks or through the use of foil or paper stickers. A wide variety of marks were used throughout the histories of Eagle, Niloak, and Hywood. We have described many of these marks below and have provided images with examples of most of those marks. There were other marks used, and these may occasionally be encountered by collectors. 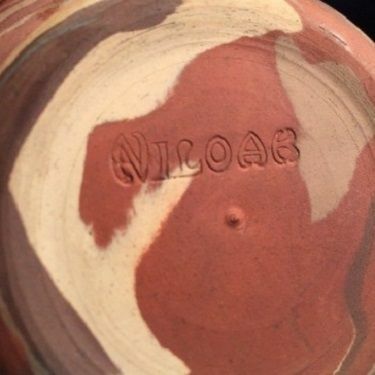 As of this writing there are no known examples of pottery falsely marked as Niloak, so at this time any piece marked as Niloak is likely to be authentic. 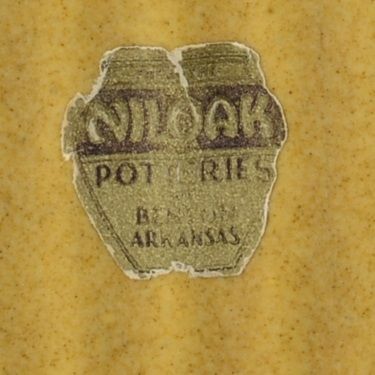 The first marks for Niloak were used in 1910, and these are often referred to as the "Benton" marks, because they include "BENTON, ARK." 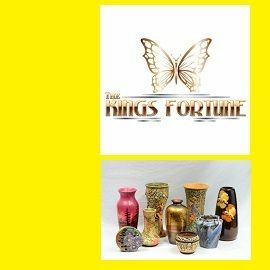 These are both circular die impressed as well as circular ink stamps that state "NILOAK POTTERY BENTON, ARK". 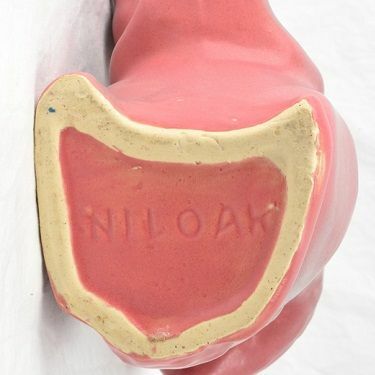 The second marks for Niloak Were die-impressed block letters "NILOAK", which sometimes included "PAT. PEND'G". These were both used before September 1910. 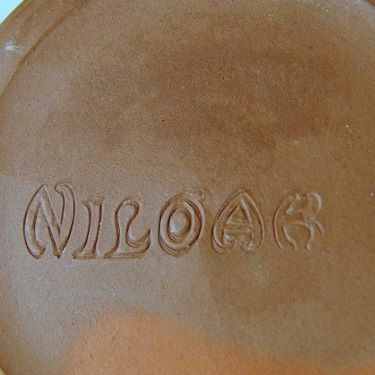 The round Niloak sticker (fig. 1) is commonly found printed with blue on white paper, although red on white are occasionally seen. These stickers were found on Niloak from 1910 through the 1920's. 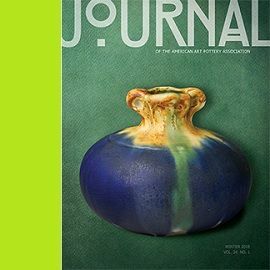 The First Art Mark (fig. 2) was used until 1924, and the Second Art Mark (fig. 3) was used from 1925 until the end of swirl production in the 1930's. 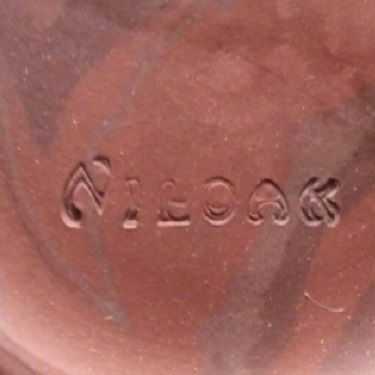 These marks will be found on nearly every authentic piece of Niloak mission swirl pottery Occasionally only a partial impression of the mark may show, and those pieces with bases too small for the die would receive a round sticker instead. The first Hywood mark (fig. 4) was an ink stamp used from 1932 until 1934. 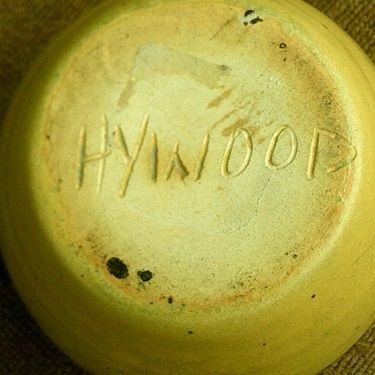 The hand-incised Hywood marks (fig. 5) were used with both cursive and block letters and were used from 1932 until 1936. 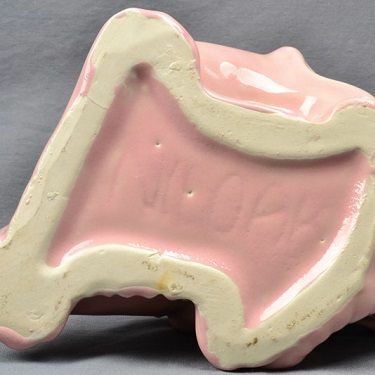 The late Hywood marks (fig. 6) were used from 1935 until 1936. 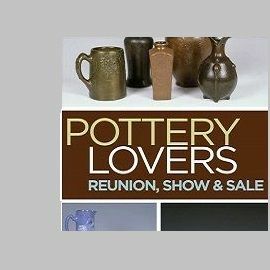 Two stickers were used in the later years, the Potteries sticker (fig. 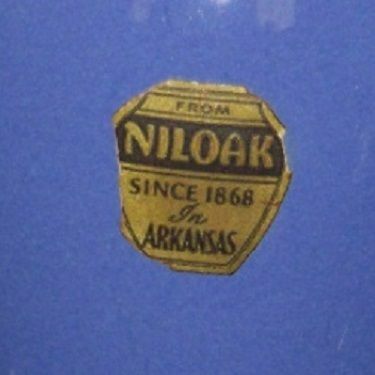 7) was used from the early thirties until the late thirties, and the Niloak Since 1868 sticker (fig. 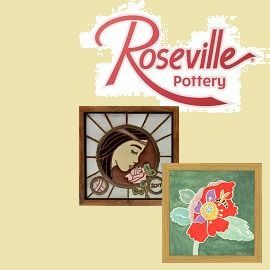 8) was used from the late thirties until 1947 on castware. 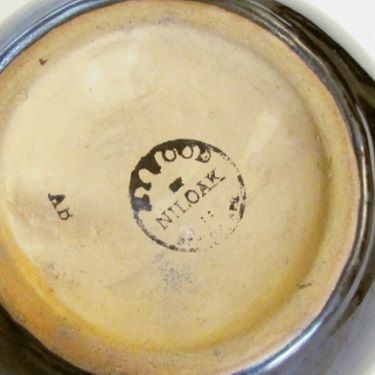 Two types of NILOAK incised were used on castware between 1939 and 1947: The print (fig. 9) and the Curved (fig. 10). The Raised Block Letters (fig.11) were used from 1937 until 1939.
fig. 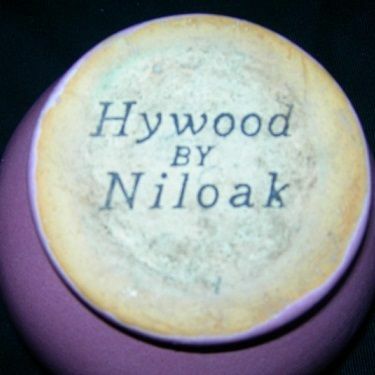 5: Hand-incised Hywood mark. fig. 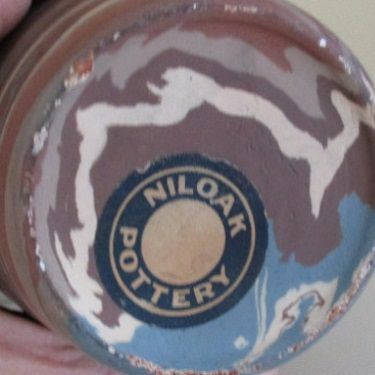 7: Niloak Potteries sticker. fig. 10: Late curved mark.